This post features a football-shaped s’mores Snicker’s brownie batter dip. The brownie batter is egg-less and an easy no-bake recipe. 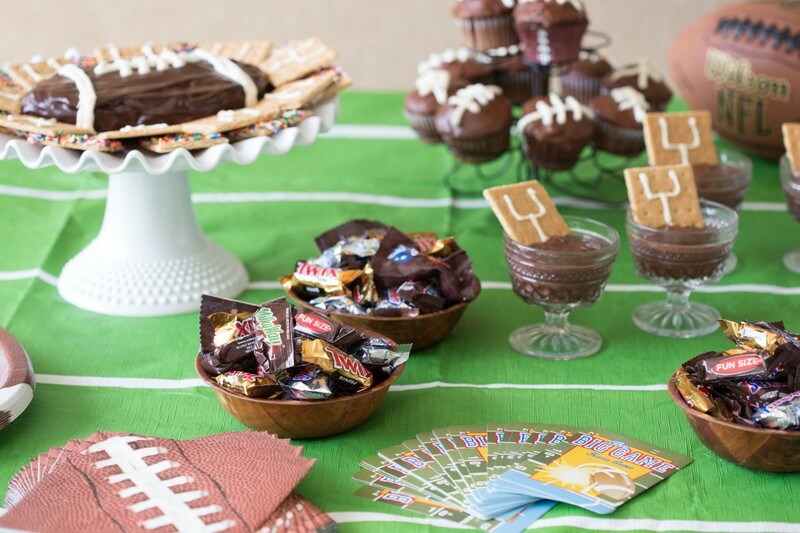 Plus some fun football party ideas and some other fun chocolate candy bar recipes. So it’s a little early, but football season is right around the corner! Are you all excited? I can’t wait! I will, however, admit I am always more excited about the food aspect than the game aspect. I mean, game food is totally the best. All that junky, make-you-feel sick food while enjoying a game? Love it. Personally my favorite is always a 7-layer dip – give me that dip and a bag of chips and I can seriously do some damage. And if we are talking desserts, I’m all over the dips too. Fruity dips with lots of fresh fruit or savory cheese dips with chips and veggies – both great. But a chocolate dip with cookies or (in this case) graham crackers — oh yes; that’s the best. This isn’t any ordinary chocolate dip though. It starts with an egg-less brownie batter (from my no-bake brownie bites), and then gets all s’more-ified. Marshmallow fluff, chopped snickers, and … wait for it … graham cracker dippers! Except these dippers are the cutest! They are decorated to look goal posts and fan crowds. 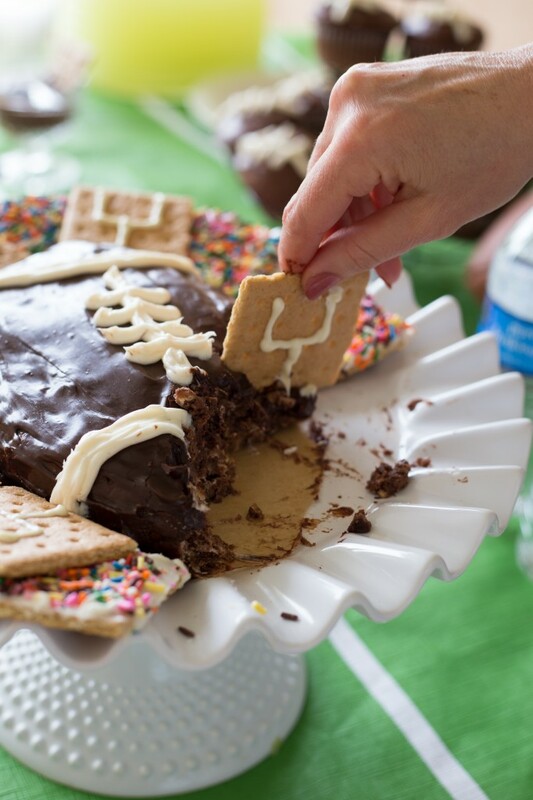 White chocolate decorates the graham crackers making a goal post sign and then sprinkle jimmies (or you could use nonpareils) to create “fans” in the football field. Okay, but I’m getting ahead of myself! Back to the actual dip. It’s really easy and can be assembled in minutes. 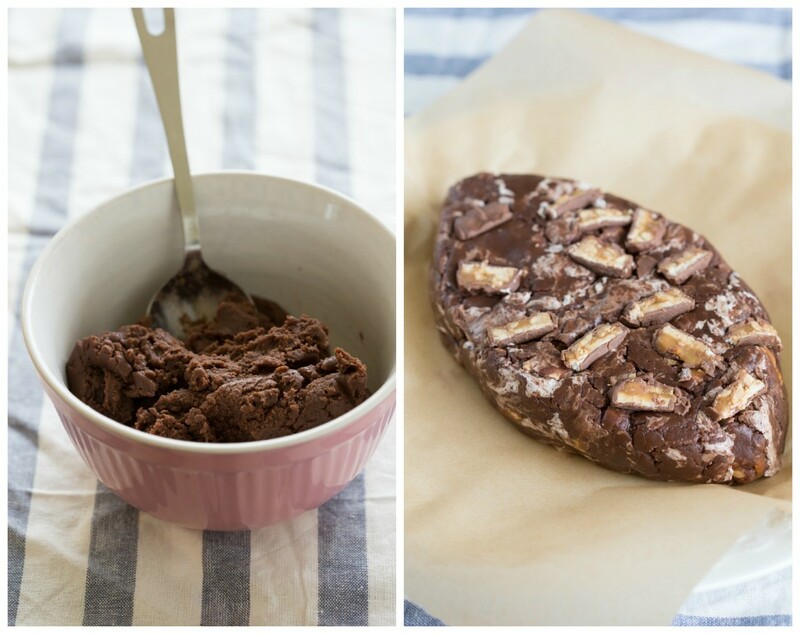 First – the brownie mix + butter gets mixed together. And a little bit of heavy cream to thin it out a bit. Then you let the melted butter cool before mixing in the chocolate candies and marshmallow fluff. Once it’s cooled and those two ingredients are stirred in – it’s time to form the shape of a football. Basically I just kneaded the mixture and formed it into a large ball. Then I flattened it and shaped it with my hands into the shape of the football. To add even more fun and flavor to the football, I covered it in a chocolate ganache. And then decorated it to make it look like a football with cream cheese frosting. No special piping tools were used; I just used a plastic bag that I cut a hole in the top of! Yep – even for the goal post “dippers.” I melted white chocolate and poured it in a bag, cut off the top, and then piped it in the shape of a goal post. With the frosting, I coated the other graham crackers and then dunked them in a bowl of sprinkles. To make this dip festive for a party you can put it on a cake stand and place the dippers all around the football! Beat together the brownie mix and softened butter until combined into a thick dough. Beat in 2 tablespoons of the heavy whipping cream. Allow to cool from the warm butter and then beat in the marshmallow fluff. Remove the wrappers and thinly slice the Snickers. Stir in the Snickers pieces into the dip. Mix and if needed, knead the mixture until the ingredients are well combined. Roll into a ball and then flatten and shape into the shape of a football. In a small microwave-safe bowl, combine the chocolate chips and remaining 3 tablespoons of heavy whipping cream. Microwave in bursts of 30 seconds stirring in between bursts for 15 seconds until melted. Pour the chocolate ganache and spread evenly over the dessert football. Place in the fridge for about 30 minutes to allow it to set it up. Place some cream cheese or vanilla frosting into a frosting bag or a plastic bag and cut off the tip. Pipe the laces on the football and place in the fridge until ready to serve. To make the dippers, separate the graham crackers in half. For the "fans" spread frosting evenly over the crackers and then dip into either sprinkle jimmies or nonpareil sprinkles. Shake off any excess sprinkles. To create the goal post dippers, combine the white chocolate and vegetable oil in a small microwave-safe bowl. Microwave in bursts of 30 seconds, stirring for 10-15 seconds in between each burst until melted. Transfer the mixture into a small plastic bag and cut off the very tip. Pipe a goal post onto the graham crackers and allow to completely dry. Since I’m staying in Utah and visiting family for most of August, we threw a little football party with all the fun desserts. My littlest sister had some of her friends over for the treats and then for some sports playing after. Here’s a sneak peak at the party and the other recipes! Another one of the recipes we did were Snickers Football cupcakes. These were pretty easy – basically my doctored up cake mix stuffed with snickers and decorated with frosting to look like a football. Feel free to make your own cake and frosting from scratch, but I feature easy recipes on this blog and these cupcakes are certainly easy for a party! Preheat the oven to 350 degrees F. Line a muffin tin with liners and set aside. In a separate bowl, combine the eggs, vegetable oil, sour cream, vanilla, and buttermilk. If you don't have buttermilk, combine 1 cup of milk with 1 tbsp. white vinegar in a separate cup and let sit for 5 minutes and then add to mixture. Fill up the liners 3/4ths the way full. Remove the Snicker's from the wrapper and cut into four equal parts. Press one piece into each cupcake. Once the cupcakes are cooled, spread chocolate frosting over them. Fill up a plastic bag with vanilla frosting, cut off the tip of the bag, and pipe laces over the chocolate frosting. There were some pudding cups – just chocolate pudding put in trifle dishes and garnished with a goal post graham cracker. These were easy and fun to make! 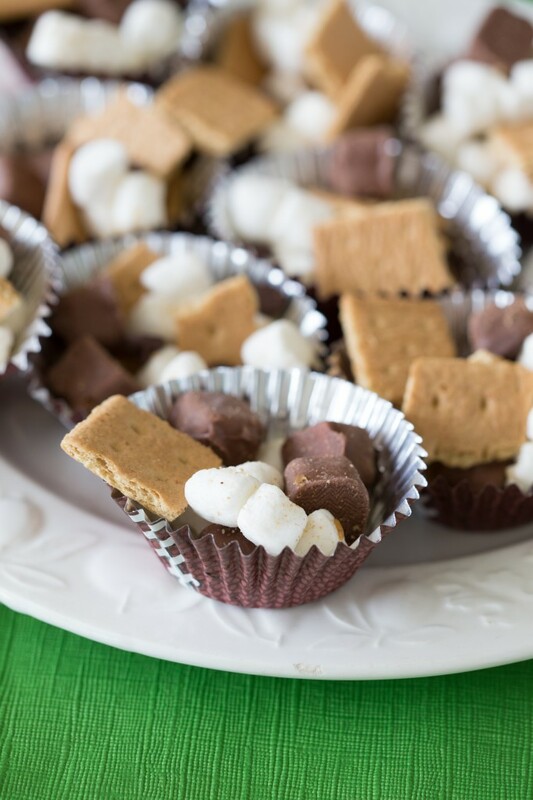 To make the pudding cups s’mores inspired, you could easily mix in some miniature marshmallows! And the final little treat we made were some small snack mixes. I found some cute football decorated cupcake wrappers which I used to hold the snack mix. I don’t have a recipe for these because I didn’t really measure out too much of anything – it was pretty much just mixing a few ingredients together – about 2 cups marshmallows, 1 package graham crackers broken up, a large handful of chocolate chips, and one bag of Snicker’s bites all mixed together and then put in these cupcake wrappers. This is AWESOME girl! My hubby has been reminding me Incessantly that it’s almost Football season and I have not been excited…but, I’ll just bury myself in this dip until it’s over! Pinned! Great work Chelsea! I’ll keep this in mind for boys birthdays too. 🙂 Looks fun. Chelsea, this is amazing! Please come to our tailgates or just come over. This is so creative and looks delicious. The food is the best part of watching a football game! What a fun dip, Chelsea! So perfect for the upcoming season, and my husband would LOVE this! Pinned! What an awesome dessert dip! I LOVE football, the game and the food! Can’t wait for the real games to start! What a fun treat for football season! How cute is that! Love all of your creativity! Well aren’t you just too cute! I am with ya…food is way more exciting than football! My hubby will be all over this as it has all his favs in it. Pinned! geeze Chels, it’s like you don’t even care I’m on a freakin’ wedding diet over here!!! I would literally kill for just one dip into this baby, it looks SO good!! definitely adding it to my post-wedding “make” list – Pinned! Those turned out soooo cute. Perfect for ‘little boys’ of all ages. Ha! And I wouldn’t be opposed to eating one either. 1000x yes! Football treats are the bomb. I don’t like football, but I love the food. Pinned! even as a non-football lovahhh….I gotta say….this is adorable. And tasssstyyyyy! Ryan’s family is REALLY into football. Can’t wait to bring this to the first game of the season! How cute and perfect is this for a crowd! What a great idea Chelsea – i love this for football season! Brownie batter scooped up with graham crackers? Genius! I just want to dig in. Will deff be trying this out for some of my football parties this year (Go Cowboys!). Pinned!